Mark Feasel, vice president of Schneider Electric’s electric utility segment and smart grid business in the U.S., explains how microgrids-as-a-service could lead to a surge in microgrid use. Elisa Wood, editor-in-chief of Microgrid Knowledge, interviews Feasel at Microgrid 2017. The thought of researching, funding and installing a microgrid can be a daunting task. If you run a hospital, a university or manufacturing facility, you don’t have a lot of time to focus on the management and purchase of your energy supply. And it can be expensive to maintain experts on staff to choose your energy system and get the most out of it. As a result, customers face unfamiliar risks in energy markets that they aren’t prepared to mitigate, according to Mark Feasel, vice president of Schneider Electric’s electric utility segment and smart grid business. Fortunately, an “easy button,” now exists for energy consumers, what Feasel describes as “microgrids-as-a-service,” an approach which offers the benefits of microgrids without the upfront costs and the development and operational hassles. 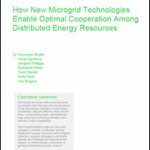 Microgrids-as-a-service provides a project tailor-made for the end user — with less work and less risk. This is not an entirely new concept, but mirrors contractual arrangements that have been used for many years by the solar and energy efficiency industries. “In a way it’s an extension of those things,” Feasel said. This easy button has emerged as demand for microgrids grows, driven by what Feasel calls the “Three D’s” of energy: decarbonization, digitalization and decentralization. “While people may have some ambitions around changing how they buy energy and getting more green, the method to achieve that still entails things they are not used to doing, taking risks they may not be prepared to mitigate,” he said. 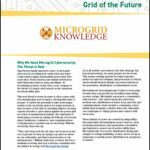 By shifting those risks away from the end user, microgrids-as-a-service frees more businesses and institutions to explore the technology. Mark Feasel is vice president of Schneider Electric’s electric utility segment and smart grid business in the U.S.